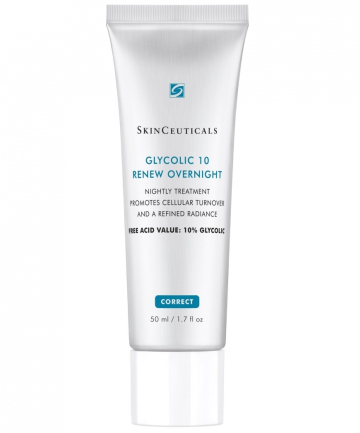 SkinCeuticals Glycolic 10 Renew Overnight, $80 This lightweight night cream packs a deadly punch against dull, uneven complexions. Containing 10 percent glycolic acid from sugar cane and 2 percent phytic acid (an acid found in seeds and legumes), the duo works wonders at exfoliating and brightening the skin. Unlike many acid-based night creams that can dry out skin, this one features a botanical oil blend that nourishes skin and creates a protective barrier to lock in moisture. You'll notice a drastic change in texture and clarity after using.